In its early days, GDS published a set of design principles to guide the building of new digital services. These principles were a codified version of a set of practices that had developed during the building of Alphagov and the beta of GOV.UK. Teams in GDS followed this principle in several ways – from coding in the open, to speaking at events, to publishing a weekly video talking about what was done that week. One of the most important ways was writing blog posts. Publishing blog posts about the work you’re doing is a great way of making things open. It lets you share information and advice with people outside your organisation who are working on similar things. It helps you gather feedback. It helps people understand what you’re doing, and more importantly why you’re doing it – clarifying your vision. Done right, it can help generate some excitement about the work. The GDS blog started as a simple WordPress site that talked about how Alphagov was built. Later, Neil and Pete took it a step further with a tumblr that talked in detail about what they were working on and why they were making certain decisions. Over time, GDS launched the government blogging platform – GOV.UK Blogs. This was designed as a place where teams right across government could talk about and share what they were working on. As GDS built new services and set up communities of practice in different fields around government, they set up blogs to work in the open. Over the course of the last 7 years, GDS has maintained around 15 separate blogs, covering subjects like how GOV.UK works, Technology in government and Accessibility. At the height of its “Transformation programme” to build 25 exemplar digital services, GDS was publishing posts twice a day (on average) across 14 different blogs. These posts covered things like how to do agile governance, how GOV.UK was going to expose beta services to users, and how do unmoderated research with eye tracking. Many digital teams across government followed, with new blogs being established for the digital teams at MOJ, DVLA, SFA and others. Working out loud and talking openly about even small changes was normal practice. It was just a thing that happened. Fast forward to 2018 and things are different. Blogs that were once active, now lie dormant – untouched for months. GOV.UK Verify last published in March. Digital Marketplace in April. Government Technology was last updated 9 months ago. Other blogs have seen their frequency drop – Government as a Platform published 35 times in 2016. They only managed 16 last year. In fact, GDS more than halved the number of posts published in 2017. A huge downward trend. Some GDS blogs are now updated on average less than once a month. GDS is no longer working in the open. But the downward trend doesn’t just apply to GDS. 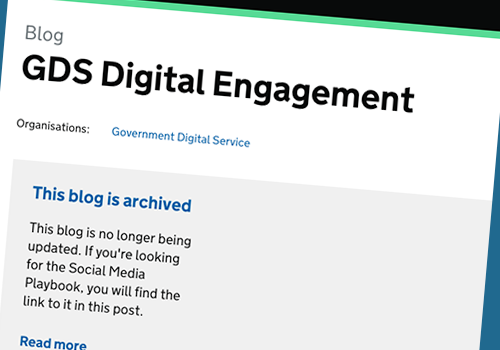 Of the 34 blogs on GOV.UK Blogs related to digital services across government, only 4 are posting more than once a week – HMRC, DWP, Defra and the main GDS blog. Most (28) blogs are posting less than once every 2 weeks. Eight of them haven’t posted in months. In 2015, the DVLA digital team published 36 posts, an average of 3 posts a month. In 2017, that’s dropped to less than once a month – they posted just 7 times in the whole year. The digital team at BEIS (formerly BIS) published 40 posts in 2014, and just 3 in 2017. In MOJ, there were 47 posts in 2015 but just 13 last year. The quantity of posts doesn’t necessarily equal quality. However, it does give you an indication of the culture and practice across digital teams in government. GDS is facing growing public criticism about what it’s delivering and it’s vision. This comes at a time when GDS is significantly reducing how much it talks openly about it’s work. Some of this criticism might be avoided if they talked and shared more openly about the work going on inside the organisation. Working in the open is healthy. It helps others understand your thinking. It helps expose you to other points of view. It helps keep you honest. Talking about even small changes or insights helps others build better services. But more than that, working in the open helps others understand why you’re doing something in a particular way, and the approach you take to solving problems. GDS is no longer thinking out loud. And digital government is poorer for it. Sources: GOV.UK blogging platform. Data from the last 6 months covers 1 August 2017 to 31 January 2018. Google Spreadsheet.